What do pumpkins, Godiva, Triberr, and FoodBuzz have in common? Pumpkin Recipes! The breezy and below 90 temperatures here in SW Florida were enough to inspire the purchase of a sugar pumpkin. Couple the beautiful weather with inspiration from my foodie tribe mate Arlene and Godiva’s special fall coffee flavors; well you get these delicious pumpkin infused home baked treats! I do so enjoy being a geek and a FoodBuzz Tastemaker. Last year the microwave and roasting methods were used to cook my pumpkins. This time the pumpkin was halved, cleaned, and steamed for about 15 min each half. I turned them after about 5 minutes of steaming. I really liked this method best as the pumpkin didn’t need to be drained and sieved. The 2.5 lb pumpkin yielded 2.5 cups of mashed pumpkin and cost 40% less than canned pumpkin. In a large bowl, combine the first seven ingredients, whisk to combine. In another bowl, combine the eggs, pumpkin, water and oil; stir into dry ingredients just until moistened. Stir in chocolate chips, flax seeds, and oats. Pour into two greased 9-in. x 5-in. loaf pans. Bake at 350° for 70-75 minutes or until a toothpick inserted near the center comes out clean. Cool for 10 minutes before removing from pans to wire racks to cool completely. Wrap in foil and freeze for up to 3 months. To use frozen bread: Thaw at room temperature. I froze one loaf as directed. No one, including me, could tell that the pumpkin bread had been frozen. Score! This is a great recipe to get ahead of the holiday baking season. Oh my gosh, this was the most moist and luscious pumpkin bread I ever baked. The caramel coffee flavor added a rich aspect to the pumpkin and chocolate blend. Flax seeds and oats created the ultimate crunchy contrast. I reduced the amount of sugar and the chips called for by half a cup each. Hubby and I concur both could easily be reduced by another half cup for those who prefer a lesser sweetness. Put all of the ingredients in the bowl of a mixer and beat on medium until evenly combined. For 12 muffins fill wells using the entire batch of batter. Whisk the pumpkin pie spice with the powdered sugar. Add the vanilla extract and the milk. Whisk until smooth and lump free. Drizzle over completely cooled muffins. Upon first bite it was quite apparent to me why these are labeled never fail muffins. Not only was the muffin recipe easy to prepare but also perfectly baked in 15 minutes. The texture is amazing, not as dense as a tradition muffin yet heavier than a cupcake. This is now my “never fail” pumpkin muffin recipe as well! I always have issues with glazing baked goods. The muffins were definitely cooled completely yet the glaze soaked into the muffins unlike Arlene’s beautiful muffins!! I would to like try glazing the next day but muffins never seem to make it long enough to do so in my house. Have a glaze suggestion or tip for me? 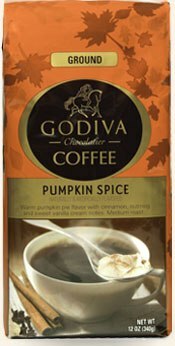 Thanks to FoodBuzz and Godiva Coffee for providing me with two bags of delightful fall inspired coffee!